Barcelona goalkeeper Jasper Cillessen has seemingly dropped a major hint that he’ll still be at the Nou Camp next season. The 29-year-old joined the Catalan giants from Ajax in 2016, but he has been limited to just 28 appearances for the club since then. Injuries and competition from Marc Andre ter Stegen have ensured that he has remained a back-up option throughout, and so question marks were understandably raised over whether or not he would seek an exit to secure regular playing time elsewhere. That was what was suggested by Goal.com last year, but it appears as though the Dutch shot-stopper has other plans as he dropped a big hint over his future during a Q&A with future club teammate Frenkie de Jong. “What day is Sant Jordi celebrated?” he asked. After De Jong doesn’t get the answer right, Cillessen responds: “No, it’s on April 23. Next year, when I’m still here, I’ll remember and we can talk about it the day after my birthday then. April 22 is my birthday,” he is quoted as saying by Sport. 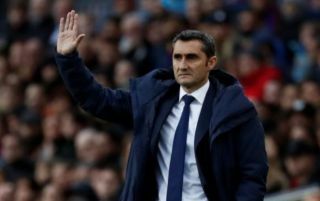 That would suggest that he has no intention of leaving the Nou Camp this summer, although naturally the situation could change before then as he continues to sit on the sidelines. His prospects of pushing his way into the starting line-up look slim too given ter Stegen continues to play such an important role in Barcelona’s pursuit of success. Cillessen though could make his mark on the season still, as having been an almost ever-present in Ernesto Valverde’s XI in the Copa del Rey prior to getting injured, he’ll hope to feature in the Final against Valencia on May 25 to help secure a trophy for the club.